Micro aerial vehicles (MAV) promise the ability to search collapsed buildings, spy on terrorists or sniff out biological weapons. But current designs have military and police forces in a flap - scaled-down helicopters or planes are inefficient and lack maneuverability. Cue the robo-bat, a miniature flying robot created by researchers at North Carolina State University that uses the same efficient flapping motion as real bats. 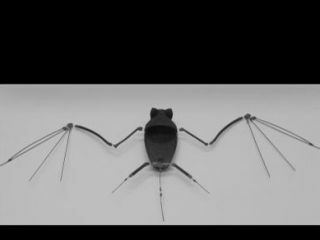 The researchers did extensive analysis of bats' skeletal and muscular systems before developing a robot using rapid prototyping technologies. The fully assembled metal skeleton weighs less than 6 grams. "The key concept here is the use of smart materials," says Dr Stefan Seelecke. "We are using a shape-memory metal alloy that is super-elastic for the joints. The material provides a full range of motion, but will always return to its original position – a function performed by many tiny bones, cartilage and tendons in real bats." The research team is also using smart materials for the muscular system. "We're using an alloy that responds to the heat from an electric current. That heat actuates micro-scale wires the size of a human hair, making them contract like metal muscles," says Seelecke. "During the contraction, the muscle wires also change their electric resistance, which can be measured to provide sensory input. This dual functionality helps cut down on the robo-bat's weight and allows it to respond quickly to changing conditions – such as a gust of wind."